As far as US states go, Colorado is a pretty fantastic one. Winter means miles and miles of mountains perfect for skiing – the same hills that turn into great hiking terrain in the summer. The state is one of the most prolific in the country for craft beer production, and there’s even wine country in Colorado as well. It’s hard to pick a favourite, so go exploring – here are some of my Colorado faves. Denver is a great city, and I’d be remiss not starting any Colorado adventure without mentioning it. It’s the largest city, right smack in the middle of the state, and from old world hotels to modern restaurants and a buzzing nightlife, Denver is where it’s at. The city is known as the “mile high city” because it’s 1 mile above sea level – a good place to get adjusted before heading up to higher altitudes. I love Durango for it’s quirky nature, the fantastic Durango-Silverton train, and the easy/budget-friendly ski and snowshoe scene. Durango is also hot for breweries and restaurants – tons of fun all packed into a small town. Keystone is a small town, and yet it’s a sprawling spot full of fun apres ski bars, restaurants, budget-friendly vacation apartments, and pleasant hikes. You can get to some crazy altitudes – and some amazing views to boot. When a town has something called a “brewmuda triangle,” you know you are in for a long night. Ft Collins is a college town, and its because of this that you get such a raucous nightlife. Along with that are plenty of more inexpensive eateries, fun kitsch shops, and relaxing outdoor cafes. Another one of those towns that feels like it would be a great place to live, not just to visit. One of the largest ski resorts in North America, Vail has plenty of wide open space for you to stretch your legs. They’re so serious about their snow sports they even have a Ski and Snowboard museum! At times this town has kind of a European flair – partly by intention, but it helps that the city attracts a variety of international travellers. Often thought of as a trendy and hip ski hotspot, there’s plenty to see and do without the glitterati in the Aspen (and nearby Snowmass Village) area. Don’t miss the beautiful Maroon Bells or wandering the shops on the main downtown street – as the saying goes, there’s something for everybody! Breckenridge is one of the most beautiful towns in the Rocky Mountains, and that’s no secret – Breckenridge is also the most popular ski resort in the United States. Boulder is sort of the “Portland of Colorado” as the city has long proclaimed itself as the state’s “weird” capital. 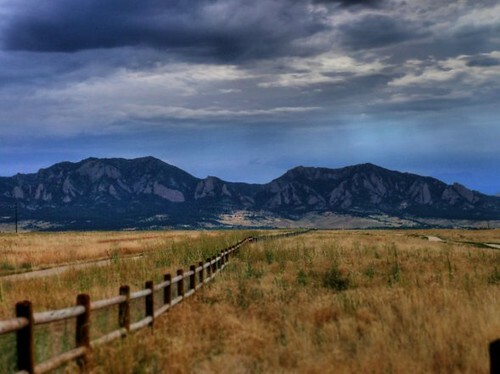 I love the lifestyle of Boulder – everyone seems to be happy, and the city makes for a great base, it being just an hour from Denver. Another urban centre, Colorado Springs has some great attractions itself, as well as a jumping off point for spots like Garden of the Gods and Pike’s Peak. Last but not least we have Cortez, which is a very tiny town on the southwest corner of Colorado. It’s a great base to visit the Four Corners (where Colorado, Arizona, Utah, and New Mexico all meet at a single point), but the main highlight here is the Mesa Verde UNESCO World Heritage site.